Do you have an account with Union Bank of India? Have you activated Net Banking services for your account? Net Banking facilities open up new convenient ways for the account holders to make transactions, obtain account information, etc. You need not visit the branch or ATM to make the balance inquiry, mini-statement or transferring cash. Apart from getting access to these services, you can manage the Debit/ATM Card, place order for a checkbook and several other services. Net Banking is completely safe and convenient option of banking. You need to follow certain safety measures to stay prevented from any scams. You must also never share your Banking ID and Password with others. To access the convenient, facilities of Net banking, you need to register for Union Bank of India Bet Banking Online. You need not visit the branch to activate and access the facilities. You need to follow a step-by-step procedure to activate Net Banking online. 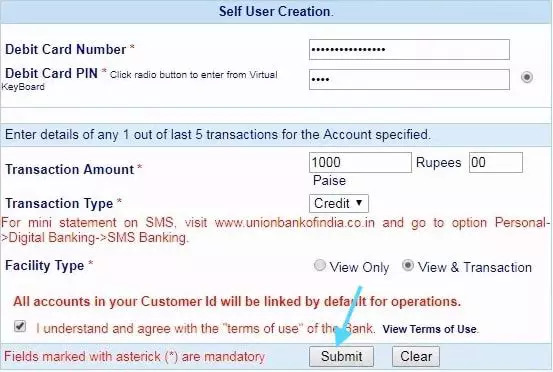 Step 1: Visit the official website of Union Bank of India for Net Banking at https://www.unionbankonline.co.in. Click on 'Self User Creation' visible on the right side of the homepage. Important Note: Make sure to keep the ATM/Debit Card, ATM PIN, and your registered mobile number along with you before following the steps. Step 2: You will get directed to a new window where you will get two options to activate/register Internet Banking services, i.e., Online Self User Creation- Retail Users Having Debit Card and Retail Users without Debit Card. 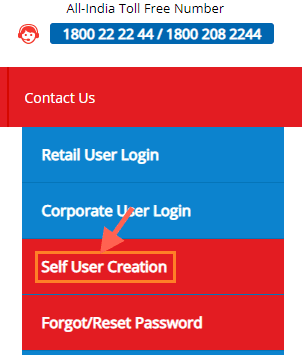 You need to select Online Self User Creation- Retail Users Having Debit Card and click on 'Continue' button. Step 3: You will get directed to a new page that displays certain essential information. You need to go through the information before proceeding forward. After going through the instruction and information, you need to enter the Account Number, Date of Birth, PAN Number, and the Verification Code. After entering the credential, click on 'Continue' button. Step 4: In the next screen, you have to enter the Debit Card Number and the PIN. Next, you have to enter any one of the last five transaction amounts and the transaction type. Select the transaction type, i.e., Credit or Debit. Also select the Facility Type, i.e., View & Transaction. Step 5: You will receive the OTP on your registered mobile number which you need to enter in the next screen to authenticate the request. Step 6: On the next screen, you will get the User ID and Name. Click on 'Continue' button. Step 7: The next step is to set the Login Password and Transaction Password. Make sure to set the Passwords as per the instructions and submit it. You have to wait for 24 hours within which the bank will validate your request and get your account registered for Internet Banking. After activation, you will receive a confirmation message on your registered mobile number. Log in after 48 hours using the User ID and Password. I want to know union bank net banking password generation steps.